Pickup volleyball games can be played year-round and courts are available on a first-come, first-served basis. There are two asphalt courts and two sand courts just east of Sheep Meadow. There are also two additional asphalt courts northeast of the Great Lawn oval. All games are BYOB, "bring your own ball". For play on asphalt courts, you'll also need to bring your own net. Permits are required only for tournaments or special events. 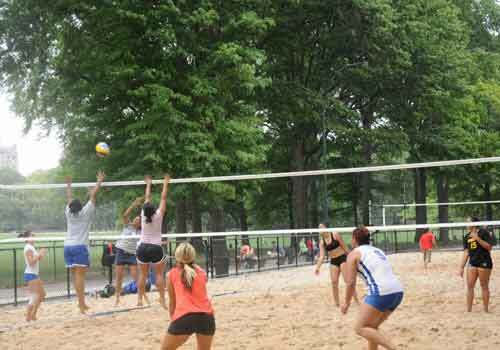 Courts can be found in two locations: between Sheep Meadow and the Mall at approximately 66th Street, and northeast of the Great Lawn oval at approximately 85th street.